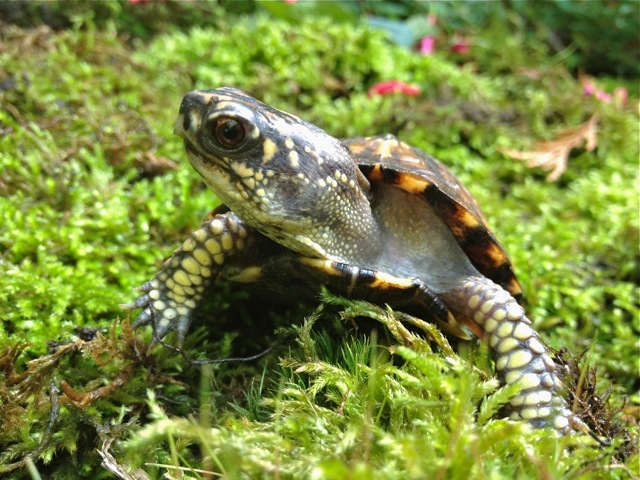 Julie Zickefoose on Blogspot: Baby Box Turtle! Ohio now has a Wildlife Legacy Stamp which you can buy to raise money for nongame wildlife conservation in our state. Each year, they hold a contest for photographers who submit shots of the chosen taxon, be it reptile, bird, insect or animal. 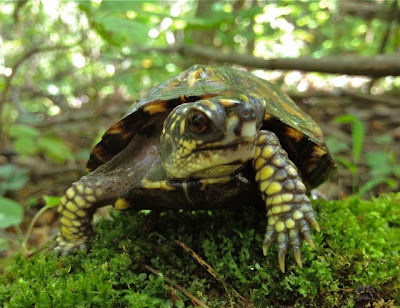 When I heard the the 2013 contest would feature a native Ohio turtle, I was hooked. I drafted JackWagon, a hatchling box turtle who was found crawling on a grassy strip in downtown Marietta near the YMCA four years ago, to be my model. I've been feeding Jackwagon for maximum growth and eventual release on our sanctuary, that being a much better home for him than a parking lot surrounded by busy roads and shopping centers. 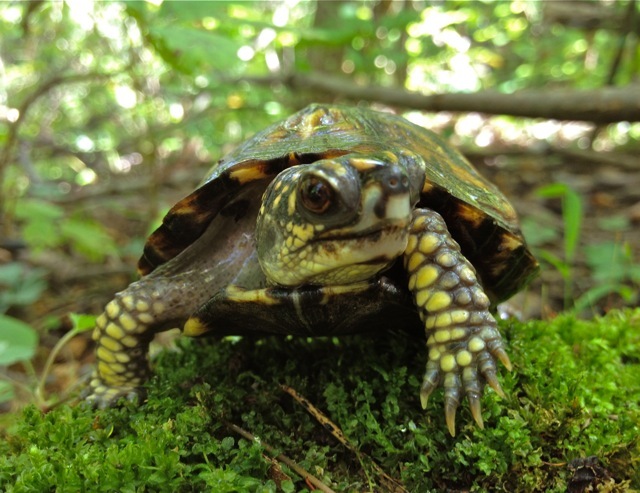 The idea is to get him (or her; it's hard to tell at this age) big and hard-shelled enough so that predatory chipmunks can't open him up like an unfortunate walnut. It works! this headstarting; see the heartwarming story of Shelly, Class of 2011. JackWagon proved to be an excellent model. In constant motion, striking pose after dynamic pose. He was a challenge, one I gladly sank to, for these photos were taken from belly-level, which happens to be the best way to photograph anything small. I looked at the background of moss and bedstraw and dappled sunlight, and decided it was probably too busy for a stamp design. 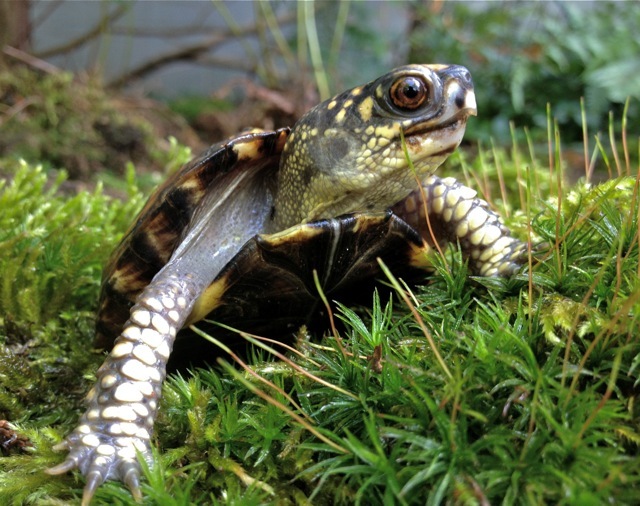 So I brought him to a bit of my garden with nice moss. I absolutely loved my afternoon in the woods with JackWagon and two cameras. He never stopped trying to move out of the frame. My beloved Canon 7D wasn't up to the lighting and motion challenge. Neither was the Canon G-12, with its shutter delay. Much cussing. I pulled out my iPhone, which has the distinct advantage that I could tell it what to focus on. No. Not the leaf in front. The turtle's eye. Focus on that. I'd touch the screen, the camera would focus on the desired bit, and boom! it was done. And JackWagon would be out of the frame again. and this squee-worthy Yertle the Turtle face. Oh my gosh. I love this photo. Not least because you can see Sluggo, my other potential model, sulking in the background. He took one look at me and my cameras and did a Marlena Dietrich on me. Pulled in his head and said no herpin' way. I knew that the fact that JackWagon's beak is slightly out of focus would hurt his chances in a photo contest. But dang. He's got personality. I sent the images to my Board of Exalted Art and Turtle Appreciators (you know who you are and thank you!!) They made their votes for the top three. Shila printed off the photos for me, I mounted them on board and sent them off with crossed fingers and high hopes. I've been doing a lot of that sending-things-off-with-high-hopes lately. You can't win if you don't play. The contest results were announced September 9. Jackwagon did not win. They chose this beautiful midland painted turtle by Sharon Cummings. A worthy opponent. Very sharp photo. And a very nice plain background. Durn it. 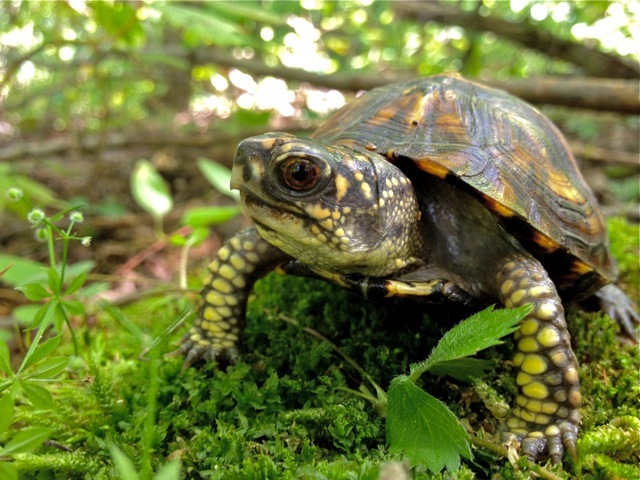 How do you photograph a box turtle in its natural habitat and get a background like that? Haven't figured that out yet. I knew, even on submitting, that there is a difference between a real photographer like Ms. Cummings and someone who happens to carry a camera of sorts everywhere she goes; between someone who's invested in serious lenses and has taught themselves how to get perfectly-lit, needle-sharp photos and someone who is down on her belly cussing, laughing and pointing an iPhone at a baby box turtle. I guess I was hoping to win it on personality. :) Zick. It's a photography contest, not a Cutest Baby contest. Congratulations to Sharon Cummings! You nailed it! We'll see this beautiful image on the next stamp. You can buy your Wild Ohio Legacy Stamp here. 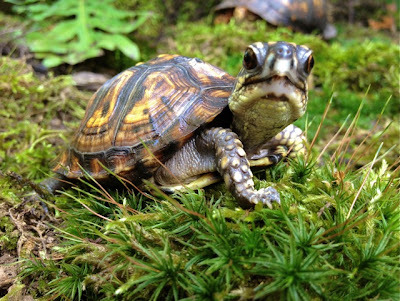 The turtle stamp goes on sale March 2014. It's a great cause, money going directly to conservation. Please buy one and show your support for the un-antlered, inedible ones we need so much. No, I didn't win the photo contest. But I got to spend an afternoon on my belly with a hyperactive baby box turtle I've raised from when he was the size of a quarter, and that is something. 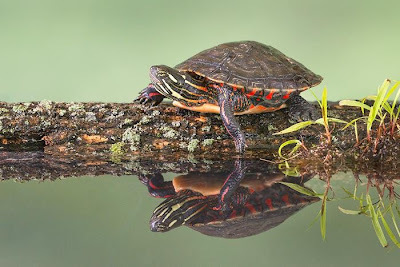 While I love Sharon's photo (it's pretty neat to see the painted turtle's reflection), your last one of Jackwagon is my favorite! You captured his personality in all the photos but especially that one. I love it! Maybe it's a good one for a painting? You didn't win the contest, but you saved this little fellas' life and gave us the pleasure of being charmed by your story of his delightful personality and your efforts to capture the perfect picture. I am sure he would want to say thank you - I do. Love your blog! Been coming here a while but have rarely left a comment. Gotta say I've just fallen a little bit in love with Jackwagon. Lovely photos! No herpin'way. Loved it. 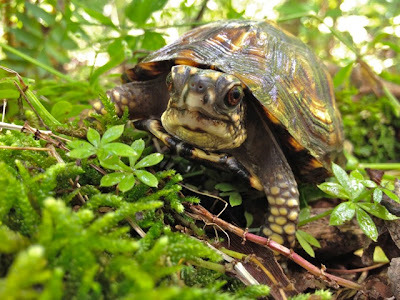 You have an eerie connection into the mind of turtles. And a wonderful knack for sharing it with us. Thank you for that!